Gallic acid and its derivatives not only exhibit excellent antioxidant, anticarcinogenic, antimutagenic, antimicrobial properties but also provide protection to the cells against oxidative stress. Gallic acid (3, 4, 5-trihydroxybenzoic acid), a low molecular triphenolic compound emerged as an efficient apoptosis inducing agent. The antimicrobial and other biological properties of gallic acid and its derivatives seemed to be linked with the hydrolysis of ester linkage between gallic acid and polyols like tannins hydrolyzed after ripening of many edible fruits. Gallic acid serves a natural defense mechanism against microbial infections and modulation of immune responses. 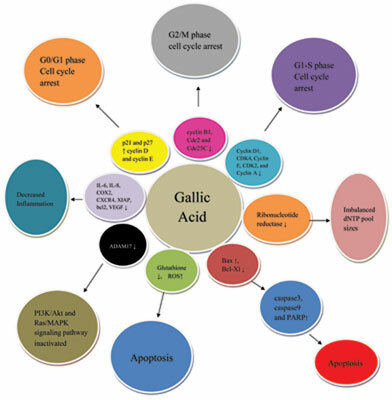 The current review updates us with the diverse roles played by gallic acid, its antioxidant potential, action mechanism and more importantly the diverse array of applications in therapeutic and pharmaceutical areas. Antioxidant, anti-diabetic, anti-tyrosinase, antimicrobial properties, gallic acid, pharmaceutical areas.